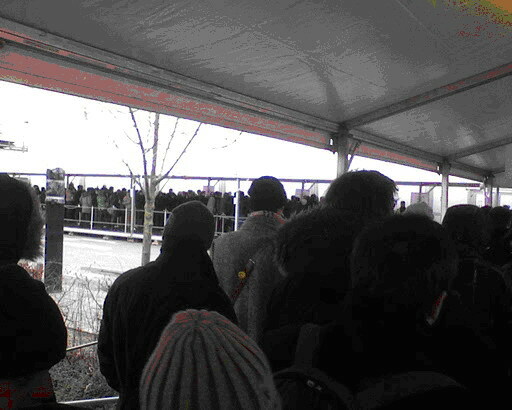 17th of December at the Bella Center remained about 300 observers from the 16 thousand registered earlier. 18th of December the Secretariat has promised to admit about the same number of public observers, but anyway NGOs has no access to the plenary sessions. Announcement: Tuesday and Wednesday to participate in the negotiations observers needed additional secondary badgesThe city center was blocked by police, because a meeting of heads of states was due to be held at the parliament building. Concrete blocks were installed around the parliament. For the first time in the history of negotiations, two organisations - Friends of the Earth and AVAAZ -- were deprived of observer status. Yesterday representatives of these organizations staged a sit-in protest between the security check rows in the complex. MEP from the French Greens, Jose Bove, was beaten by the UN guards. Some of the observers report difficulties they still face when trying to get to the plenary sessions, despite the presence of additional badges. Сhanging the rules for admission of observers, directly during the negotiations, seems scandalous. As a general rule, UN negotiations are open for observers. 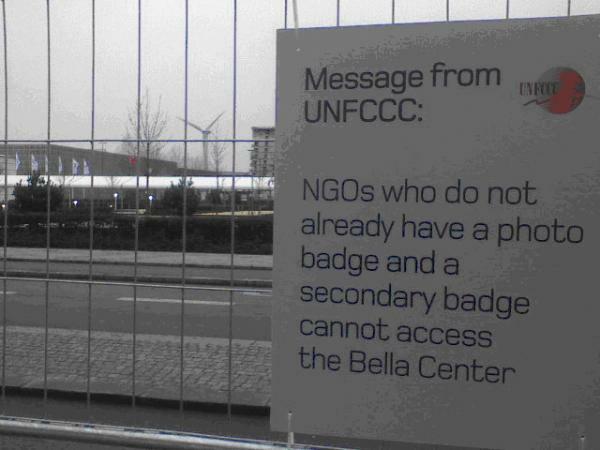 List of NGOs for COP-15 was approved two months before the start of negotiations in Copenhagen. Crowd of observers, not let in the conference buildingHowever, during negotiations, conference secretariat said that for Tuesday and Wednesday of the second week of negotiations badges will be issued only to 7000 observers. On Thursday the number of observers should have been limited to a thousand, on Friday to 90 observers. Total 35000 accreditations were originally requested by NGOs. The numbers of official delegations and the press were not limited, media could still be accredited during the negotiations, and their registration was not limited. As a result of negotiations with sekretarit, association of observers CAN (Climate action network) reached the following conditions - three hundred observers received admission to the Bella Center for the two last days of the negotiations. However, while badges on Tuesday and Wednesday were distributed to organizations for further distribution to their discretion, the new bages bore names of the holders, and the list of participants was determined the secretariat of the conference. 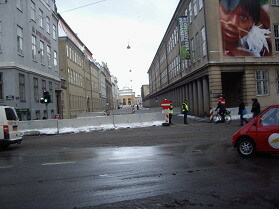 Сheckpoint of concrete blocks at the entrance to the ParliamentThose who were deprived of the right of entry, participated on Wednesday in a demonstration outside the Bella Center. Police forces dispersed the demonstration with tear gas. For some time the center did not admit anyone: neither the media nor the delegates nor observers. More than two hundred demonstrators were detained. Bulletin "Bellow 2C" (www.below2c.wordpress.com), prepared by Russia watchers, said «So far there has been no such inconsiderate treatment of the observers in the history of the UN climate negotiations. It seems that someone has decided to blame the observers with the failure of the negotiation, and so gradually drives the public interest lobbyists out from the Bella Center». Yesterday was meeting of the Russian NGOs and Russia's official delegation was cancelled. The delegation was ready to meet, but the majority of non-governmental organizations were unable to enter the building. It can be noted that at present negotiations are held with little public participation, and the decisions to be taken as a result of the conference in Copenhagen will be the most opaque in the history of climate negotiations.